South African's looking forward to some extra slots time this holiday weekend will be glad to hear that Springbok Casino has some nice Easter casino bonuses for them. High Fashion Easter Bonuses are available on Good Friday and Easter Sunday. This Friday you can get free spins on the High Fashion slot game which is now also available in Springbok's mobile casino. For a special Easter treat, a Surprise Bonus is available until April 12th. 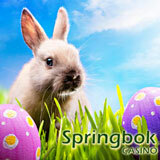 This video includes coupon codes for Good Friday and Easter Sunday bonuses at South Africa's Springbok Casino. High Fashion is a runway-themed slot game from Realtime Gaming with two bonus features. Wild Model symbols can trigger five free spins loaded with extra wilds and three or more Runway scatter symbols can trigger free spins where the middle reel is always wild. On Easter Sunday you can get a 100% up to R2500 casino bonus plus and 25 free spins on Achilles if you enter coupon code: EASTER-15 when you deposit. You can claim this bonus up to three times and there are no wagering requirements on these free spins. Keep what you win! If you deposit any time in April you'll be eligible for a special Easter Surprise Bonus. By entering coupon code E-SURPRISE you'll get a surprise which could be free spins or a no deposit bonus. This bonus is available until April 12th.